As the lovely AM and her very crafty husband A made me some giant knitting needles for christmas I thought I’d go for a stash rummage and see what I could conjure up. My thinking hat went on and I dug deep and went to the several jumpers’ worth of acrylic inherited from mother. Mainly 400g balls of the sort of stuff that would be fine for making kids clothes and that is what mum mainly did with it. I’ve not really done kids clothes. I don’t really want to either. What I wanted was a solution to my very snowy boots leaving large lumps of melting detritus in my hallway. We have laminate on the floor and it is ruining it. Not to speak of what Scotty’s bike is doing to it. I think I’ll solve that one with some cardboard. Anyhew after spending some time playing with the needles over christmas I had an idea of what was coming. Some of the wool was already balled after being frogged some time back. I got out the ball winder and started splitting some of the larger balls. 11 balls later and I was getting somewhere. I did start a jumper some time back and I don’t want it now. The yarn was an aran weight and added in nicely. At 14 separate yarns hauled together I had my wool. These have been placed in several plastic bags so that they roll out evenly. They only get tangled up when they’ve splayed out of shape. After a bit of huffing and puffing. The knitting on these needles is what I would consider a full upper body workout. We have a rug in progress. 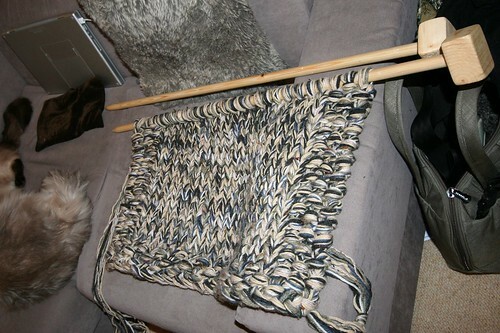 I want to make it longer but it all depends how heavy and impossible it gets to turn each row. For the moment it is about the very best thing to be knitting because its like wearing a hefty double thick blanket over your knees. The only major issue is trying not to knock anything over or smash Scotty over the head whilst I’m maneuvering the needles. Oh and I think I nearly put my back out so I’ve had 3 days not knitting to try and relax before trying some more. Now for the extra little challenge I’d love to take it to knit night for giggles. I’m sure it will raise several eyebrows, not so much with the regulars but those passing by the forum. This is how I get my kicks, I like the extravagance at the same time as the frugal practicality. You would not believe how much it confuses people. That is how fast christmas went past. I had the whole time off as holiday so it went very quickly and I rested so very well and enjoyed the time off completely. Before Christmas I placed a bid on a villa owned by a colleague placed in a sort of charity auction for Barnados. I gave the money to the charity and I get a week away in Spain in this lovely colleagues villa. We’re still trying to sort out dates and all that but it’s nearly another holiday organized. Then Christmas creeped up and shopping had to be done and we all tried to get together in the family but on Christmas day my lovely Nice was very sicky and we didn’t all make it to the same place. In stead we all got together on the Monday after Christmas which was lovely. Bonuses: I got what I asked for! Sock blockers, a needle gauge pendant, chocolate and a new salt and pepper grinders. Double bonus: Went out in the sale and got two pairs of Clarks shoes for under £50. BARGAIN. Tripple bonus: on New years eve I went over to AM’s place to have a little impromptu knit night whilst her husband entertained his friend in the pub. We snacked on dips and knitted. I made AM a GIANT ball of wool from some track suit fabric, velour I think it is. This is to say thanks for the big needles she made me. My sister LOVED her scarf so much in fact that the 3 times I did see her over Christmas she was wearing it constantly. Which reminds me, we’ve still not had that pamper day, but that is because I messed up the booking and found out the last minute vouchers have to be sent off AGAIN. They are not intuitive to use, not helpful in any way, and could leave us with something that is entirely useless if we both can’t get a full week day off work. Oh and My Nice loves her mitts too. YAY! Scotty and I played Lego Indiana Jones until I could see cross hairs and twirling lego coins in my vision. At that point we did stop and do other things like watch movies, knit, cook, clean etc. I’ve been back at work the best part of a week now and we’ve only just got PROPER snow in the city. It was very icy near my brothers house in the sticks and pre-christmas it iced up and rained on the ice so I slipped in our close. Outside our house seems to be the worst part of the journey to work and back but I just love the snow and would like a whole lot more please. It will never stop me getting to work. 🙂 hopefully the next update will be soon. I’m sure I’ve missed a ton of good stuff off the blog that needed to be put down in text but hey, can’t win them all. I’m just happy we’re all here, healthy and ready for fun. You are currently browsing the Jiva a soul in transit blog archives for January, 2010.